For 100 years, the process industries have relied on U.S. 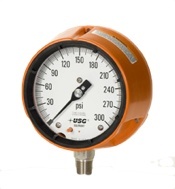 Gauge for accurate and reliable pressure measurements. For over 30 years at PMT Products we have built on this experience and developed a full line of precision electronic pressure transducers and transmitters. This Pressure Measurement Technology group has developed a variety of pressure transducer and transmitter types and sizes. These are used in test and measurement, industrial, medical, agricultural, military, and automotive applications. PMT Product transducers and transmitters are available in pressure ranges from 1 to 6000 psi with gauge, vacuum compound, absolute or sealed reference. All are temperature and pressure compensated. AMETEK transducers and transmitters are available in low cost, fixed range as well as full featured, field adjustable models with 5:1 span turndown. Process or flush mount connections and CSA, FM and CENELEC approvals are available. Mansfield & Green diaphragm seals are continuous duty seal elements, excluding Models L, CS, ES, and EW Series. Continuous duty seal elements are designed to prevent leakage of the process media in the event that the instrument is compromised. This feature makes Mansfield & Green diaphragm seals ideally suited for hazardous applications, including those with harmful and corrosive gases.